We are proud to serve as this year’s faculty and staff giving co-chairs. We wanted to first thank you for all you do for Elon! We see first-hand the dedication and commitment of Elon faculty and staff that make this a special and dynamic community. Last year faculty and staff giving achieved record success, tallying an impressive 78 percent rate of participation among Elon employees. This fiscal year, we hope to build on that success by continuing to make a difference within the Elon community and beyond. Our collective participation in faculty and staff giving will further demonstrate to alumni, parents, friends, foundations and corporations that Elon enjoys broad-based support. In addition, as an Elon employee you can choose to designate your gift wherever you want on campus. Thank you for supporting Elon and participating in faculty and staff giving for 2017-18. Together we make an impact and create opportunities at Elon. Together we strengthen this renowned learning community and prepare students for lives of meaningful work and service. The 1889 Society is an annual giving society that recognizes Elon donors for their consistent support of the university. 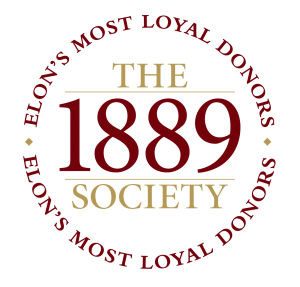 Donors become a part of the 1889 Society by making a gift to Elon in two consecutive years, and remain 1889 Society donors by supporting Elon every fiscal year.